So for the last couple of years I’ve supervised a series of undergraduates who have spent some time isolating bacteria from seagrass samples… sometimes from the plants themselves and sometimes from associated sediment. We usually used non-specific aerobic media such as Marine Broth and Seawater Nutrient Agar. The result has been a series of the usual suspects; Vibrio, Shewanella, Pseudoalteromonas, etc. We’ve sequenced a number of these genomes, examples of Genome Announcements papers like this can be found here, here, here, here, here, here and here. The goals of this culturing were three-fold; cool undergraduate projects (check), add seagrass-associated genome data to the database to aid in metagenomics and such (check), and to characterize isolates that might be important in seagrass biology (unknown). In regards to the last goal, we’ve attempted to use abundance of taxa as one rough proxy of “importance” and significant changes within an experiment as another. We have several large 16S projects to work with, but in most cases the isolates that we have generated are not found at particular abundance or significance in these datasets. And perhaps that’s not surprising, non-specific media is good at isolating widely distributed generalists. So now we plan to approach the problem from the opposite direction, we’re picking the OTUs from our 16S data that are the most interesting and attempting to selectively culture them. #1 on our hit list is Sulfurimonas which crops up over and over again. Stay tuned for results on this approach! My name is Karley Lujan and I am an undergraduate working on culturing bacterial isolates from the Seagrass microbiome. I joined this project because I am interested in learning about what information we can obtain from studying microbiomes. I think it is fascinating that although we can’t see microorganisms they are extremely prevalent and can have crucial roles in biological systems. The focus at the beginning of this project was to take Seagrass samples from Bodega Bay, create culture samples, and use Sanger sequencing of the 16S rRNA to identify what we grew. Seagrass and sediment samples were taken from Bodega Bay, CA. Then, in order to obtain isolates from the seagrass, we focused on the leaves, roots, and sediment. What we were able to successfully extract DNA from were identified as Shewanella, Pseudoalteromonas, Colwellia, Tenacibaculum, Vibrio and Alteromonas. Me (Karley Lujan) at the 2016 UC Davis Undergraduate Research Conference. Results: After Sanger sequencing, the data was ran through BLAST to obtain a tentative identification and determine whether or not the microbe was a good candidate for sequencing. Shewanella: Electrogenic- An electron generator that can be used in microbial fuel cells. Vibrio: Some species of Vibrio can go through morphogenetic changes after going from a liquid to a solid surface. This leads them to change from swimmer cells to swarmer cells. 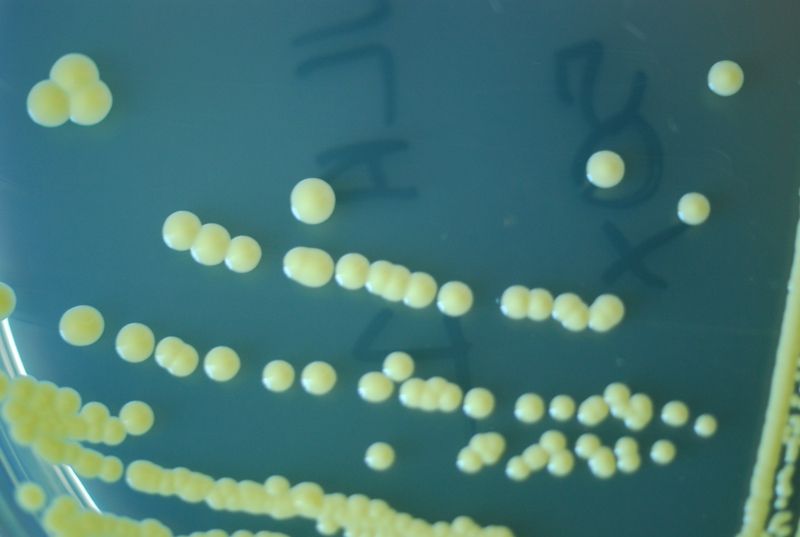 Pseudomonas: Two bacterial isolates were cable of growing on Nitrogen-Free agar plates at 25⁰C. Identified as part of the genera Pseudomonas, there are some species of this genera capable of aerobically fixing nitrogen. These are of particular interest as we will be further investigating which nitrogen-fixing bacteria are essential for seagrass health. Currently I am beginning to look at the genomes of the bacteria we decided to sequence and I am also working with bacteria that are capable of growing on the nitrogen-free agar plates. At first it was difficult to extract the DNA from these bacteria but now both have been tentatively identified as Pseudomonas through sanger sequencing of the 16S gene. This is interesting because there aren’t many Pseudomonas that can fix nitrogen which is what these two must be doing in order to survive on the nitrogen-free plates. These two bacteria also have different morphologies which means they could be different species in the genus Pseudomonas. Due to their morphological similarities yet ability to grow on nitrogen-free agar, I think these two bacteria are very interesting and we will be finding out more about them by sequencing and analyzing their genomes.